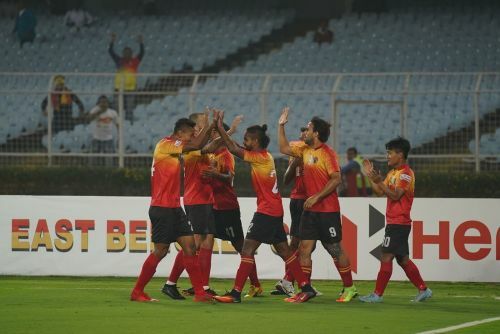 East Bengal have finally pulled off the trigger against Gokulam Kerala FC to earn a morale-boosting win in the I-League before the all-important Kolkata Derby. In their third home match of the season, the red and golds finally got back to winning ways. They defeated Gokulam Kerala FC by 3-1 at the Salt Lake Stadium in Kolkata on Saturday. After three back-to-back losses, the pressure was mounting on the coach and the players. But the team showed enough potential to register their first win at home. East Bengal were dominant in the first half as they scored two goals within the first 15 minutes. Brandon Vanlalremdika scored his second goal of the campaign to put his team in the lead. Jobby Justin scored the second with a brilliant piece of skill. After some early jitters in the second half, during which Gokulam reduced the margin, East Bengal found their rhythm once again and Lalralchullova’s goal in the 82nd minute all but secured three points for the club. The Kolkata Derby is eight days away and East Bengal will have ample time to rectify their mistakes. East Bengal might consider them lucky as they have not conceded more than one goal in the second half. The Kolkata giant were nearly flawless in the first half were as they got numbers of opportunities. Suddenly, their performance levels dropped in the second half and for at least 15 minutes as the team struggled to find their feet. Fortunately, Gokulam Kerala FC were not as much threatening as they were needed to be in the second half. That made life easier for East Bengal as they slowly found their rhythm. Also, at least two decisions of the referee went in favour of East Bengal. Firstly, East Bengal goalkeeper fouled Christian Sabah inside the box in the second half, which would’ve been awarded a penalty. Secondly, Lalrindika Ralte escaped a red card when he head-butted Felipe Castro after a rash challenge floored the former.